The original Pyramid game shows ran for many years but is season two The $100,000 Pyramid worth watching? It’s common knowledge that the Nielsen ratings typically play a crucial role in determining whether a TV show like The $100,000 Pyramid is cancelled or renewed for a third season. Unfortunately, most homes aren’t Nielsen households, and many viewers get upset that their viewing and opinions aren’t being counted. We’d like to offer you a chance to rate the episodes here. 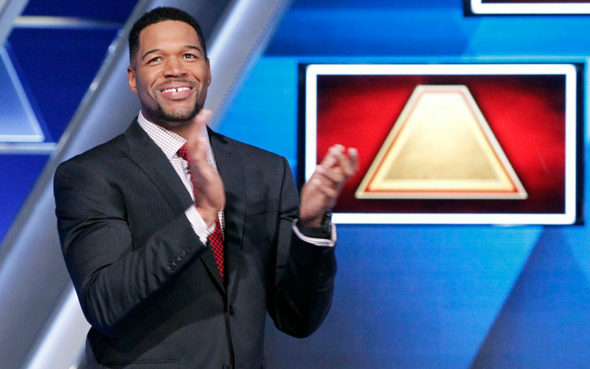 On The $100,000 Pyramid, celebrities partner with contestants and play word games to compete for large cash prizes. Celebrities appearing in the second season on ABC include: Ken Jeong, Dave Foley, Cam Newton, Brandon Marshall, Tom Bergeron, Jennifer Nettles, Margaret Cho, Michael Rapapport, Wendie Malick, Jesse Palmer, Dr. Mehmet Oz, Retta, Bobby Moynihan, Debi Mazar, Sasheer Zamata, David Arquette, and RuPaul. Also competing are Justin Hartley, Chrissy Metz, Eric Decker, Apolo Ohno, Rachael Ray, Curtis Stone, Vanessa Williams, Gary Cole, Lance Bass, Joey Fatone, Kyle Busch, Lara Spencer, Usher, Robin Thicke, Aaron Rodgers, Erin Andrews, Ali Wentworth, Kathy Najimy, Yvette Nicole Brown, LL Cool J, Willie Garson, Taye Diggs, Jenna Fischer, Cobie Smulders, Ryan Eggold, Richard Kind, Rachel Dratch, Kal Penn, Abby Elliott, Billy Gardell, Kate Flannery, and Von Miller. What do you think? Which second season episodes of The $100,000 Pyramid do you rate as wonderful, terrible, or somewhere between? Don’t forget to vote, then share your thoughts, below.